A great action video show-casing the full range of Hammerhead™ off road buggies. Place Your Xmas 2018 Deposit Now! We are pleased to say that we now offer twelve months interest FREE finance on most products over £300! New Product! Introducing The 208R Mudhead! 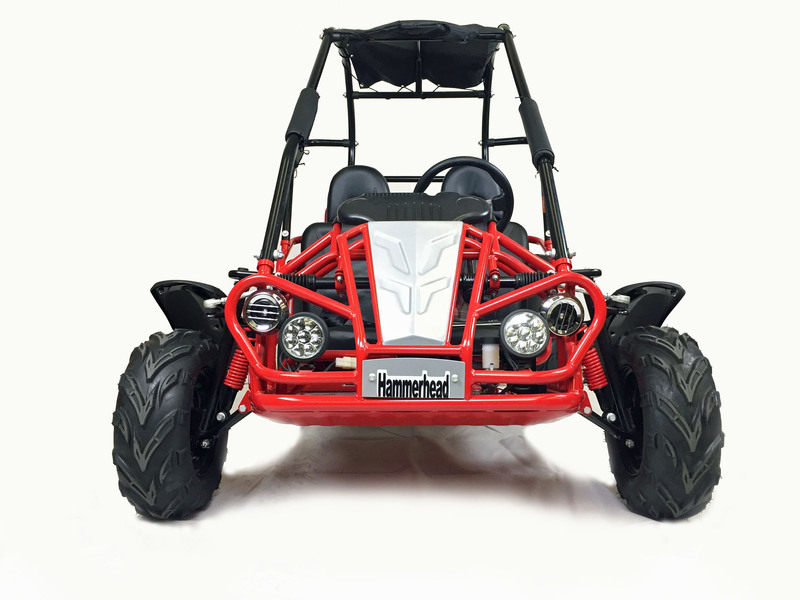 Stunning New 2018 Hammerhead™ GTS150 Buggies! The Christmas 2017 Clock Is Ticking! Hammerhead™ Mudhead Hits The Studio! We have just finished the latest studio shoot on our mighty midi Hammerhead™ Mudhead Buggies! The Hammerhead™ Mudhead off road buggy offers customers incredible value for money and comes fully equipped with a simple 'rev & go' LCT USA brand engine. The Mudhead buggy is sold in it's thousands worldwide, so no secret that this economically priced Hammerhead buggy packs a serious punch for its price! Please click here for further information on the Mudhead buggies. Hammerhead™ are now owned and managed by Polaris USA so there has never been a better time to contact Storm Buggies and join the Hammerhead™ team! It was certainly a case of 'Funday Sunday' for young Orla this weekend! Riding one of our 1000w 'Monster' kids quad bikes, she took to the machine in seconds and even had time to sing while racing around the field! What a superstar. Stunning new 2018 model 'Sniper' quad bike. Is there a better looking or higher spec branded quad bike on the market for £1099 inc VAT? We think not! Panther 110cc Kids Quad - All colours back in stock! We are pleased to say, we now have the 2017 spec Panther 110cc kids quad bike fully stocked in all three colour combinations! It's always really enjoyable for us to see customers having fun in their off road machines. Here's a great little video of young Evelyn enjoying her Hammerhead Torpedo™ kids off road buggy. Black Friday - Free Delivery Offer!